INDUSTRY.co.id - Jakarta, Through Forestival 3 meeting, representatives of ten provincial foot partners accelerate the expansion of social forestry areas through efforts to improve forest and land governance in Indonesia. A total of 150 representatives from 78 partners of SETAPAK Program (Save Forest and Land through Governance Improvement) from various provinces gathered in Makassar to attend Forestival 3, Partner Coordination Meeting which is held every six months to evaluate and synergize work programs from various movements and policies which supports improved forest and land governance through increased transparency with data use and information access, and encourages law enforcement and accountability in the forest and land sector. • Encourage improvements in forest and land governance (TKHL) as an effort to prevent and reduce deforestation and land degradation. In relation to Social Forestry, Lili Hasanuddin, Program Director of SETAPAK - The Asia Foundation (TAF) Indonesia, in a press release published today explains, a few months ago, SETAPAK partners from 10 Provinces and National level agreed consensus to collaborate all governance improvement programs manage forest and land through Forestival 2. "Now, let's speed up our entire program to be able to expand the social forestry areas in accordance with the national target and support the KLHK program," he said. Lili also appreciates the hard work of SETAPAK program partners who have contributed to national achievements, through the recognition of 34% of forest areas advocated by SETAPAK partners on the social forest agenda throughout 2017. 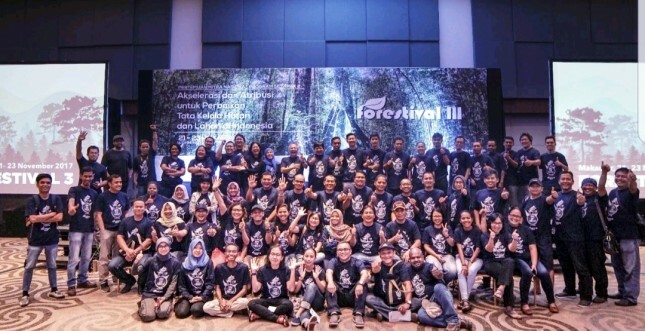 At Forestival 3 also present Bambang Hendroyono as Secretary General of the Ministry of Environment and Forestry (KLHK) who also welcomed the implementation of Forestival 3 and presented the FMU (Forest Management Unit) program to SETAPAK Partners. In his presentation, Bambang stated that KLHK wants at least 1000 production centers of village-based forest products that absorb labor and alleviate poverty in 1000 villages within the region. "This can only be achieved if the proportion of people's forest management rights increases and their presence is recognized in the Indonesian economic cycle. While the current happening is the proportion of community management rights is very small compared to corporations, triggering conflict and high management costs," said Bambang when opening his presentation. Continuing his presentation, Bambang increasingly raised the importance of moving the strategic economic sectors of forest governance in order to improve the welfare of the community. "Of the Indonesian forest area, 62.57% functions as production forest with management that still permits the utilization of timber forest products, 14.18% serves as a conservation forest with relatively good management, due to site management at the site level. Meanwhile, another 22.5% functioned as a protected forest but there was no real management in the field. Therefore, it needs a Forest Management Unit (KPH)," he explained. Going forward, the FMU will be the entry point for improved forest governance with the main objective of building Indonesia from the periphery, increasing people's productivity and competitiveness, rejecting the weak state by reforming the system and enforcing the law, embodying economic independence by mobilizing the strategic sectors of the economy. "Improving governance should lead to efforts to ensure the region is protected from tenurial conflicts, and build centers for the production of forest products," he concluded. In line with the objectives of the SETAPAK program, Dani Setiawan from the Village Ministry, the Development of Disadvantaged Regions and Transmigration (Kemendes) also explained that of about 25,000 villages in and around the forest, 71% rely on forest resources and 10.2 million people poor in it who do not have legal access. Therefore, the policy of Agrarian Reform and Social Forestry is an effort to overcome the economic, social, and agrarian conflicts and environmental degradation. Furthermore, Deni explained, in the framework of social forestry acceleration, in the future, we need a model of governance and institutional sustainable economic empowerment and impact on the welfare of the community. "There is also a lot of involvement of Rural Economic Institutions in guarding and assisting the utilization of Village Fund for Fiscal Year 2018 for Social Forestry activities," he said. At the same time, support for the acceleration of Social Forestry was also provided by the Team for the Acceleration of Conflict of Agrarian Affairs (TPPKA) from the Office of the Presidential Staff of the Republic of Indonesia (KSP). TPPKA also disclose data related to agrarian conflict until October 2017. Of the 412 cases of reported agrarian conflicts, the KSP found that many companies submitted official or individual requests to the TNI / Polri for security. Moreover, even KSP found that there are some individuals who intimidate and arrest citizens at the request of the company in handling the conflict. "For this reason, KSP formed TPPKA in order to guard and evaluate the handling and settlement of agrarian conflict. The President directly mandated that there will be no more TNI / Polri directly or indirectly involved in the settlement of agrarian conflicts in various regions," said Irhash Ahmady as TPPKA representative. After evaluating and consolidating several programs through synergy and collaboration between SETAPAK program partners as well as stakeholders and policy (stakeholders) in encouraging the improvement of TKHL in Indonesia, in this Forestival 3 times SETAPAK accelerated in various sectors, including community empowerment, data collection and proposed protection area through the Social Forestry scheme, encouraging the creation and implementation of more effective policies also encourages law enforcement processes with problematic and inhibiting concession licenses. This accelerated effort is supported by mutually complementary work (attribution) among all actors playing a role, both at the community and policymakers at the central and regional levels. In achieving this, Forestival 3 also held thematic discussions in accordance with the topics required by each SETAPAK partner, the Breakthrough of Social Forestry Acceleration, Policy, Institutional and Budget as Thematic Discussion 1, Law Enforcement Acceleration to promote justice in forest and land management as Discussion Thematic 2, and Thematic Discussion 3 raised the Improvement of Licensed Process and Licensing Systems in the Implementation of Act 23/2014. As a result of the discussion, Thematic Discussion 1 proposed a consolidation of instructions from the central level of either the Presidential Decree or the Presidential Instruction in order to use the funds of the village of Social Forestry and Indigenous Forest. In addition, the discussion also ensured that 20% of the company's licenses were allocated to social forestry, ensuring the implementation of Perdirjen no. 5 year 2016 on the obligation of companies to submit conflict mapping in concession area. In Thematic Discussion 2, SETAPAK Partners agrees to review the laws and regulations that are considered to complicate the acceleration of law enforcement such as UU 18 of 2013. In addition, SETAPAK Partners also agree on coordination in the public complaint response where if the district / city does not run the decision, immediately taken over by KLHK. Thematic discussion 3 proposes incentive schemes and disincentives for regional heads who do not exercise their authority (PP 12/2017). This is due to the closed IUP (Mining Permit) Document. While the IUP Issuance Decree is a decision of a public official, therefore it shall be open to the public where it has been recorded in the Central Information Commission Decision Register as a public document. After being filled with a series of discussions, Forestival 3 concluded with a field trip to Bantimurung Bulusaraung National Park in Maros District which is the National Park with the second largest karst area in the world after Southeast China. At this field visit, SETAPAK program partners were greeted by the managers of Bantimurung Bulusaraung National Park who explained about the management of the National Park, and its tourism potentials such as the deepest and longest Goa Expedition, waterfalls and butterfly captivity.